A new Chapter. 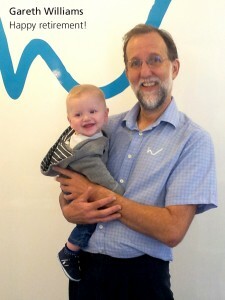 Goodbye to Gareth Williams, who leaves us after 20 years as Williams Dental Practice and 34 years in total practising Dentistry. Here’s Gareth’s thank you to all his patients. After 34 enjoyable years practising dentistry, I have decided to announce my retirement. It’s been a difficult decision, as I have developed many friendships with both staff and patients over the years and I will really miss that daily contact in the future. But, as many of you know, I recently became a grandfather, and now is the perfect time for me to move onto the next phase of my life and spend more time with my family. I suspect that I will also be spending more time with the other love of my life – my bike! With careful consideration, I decided to go about finding my replacement, a dentist who would share my commitment to exemplary dentistry and offer you care that you have been accustomed to. I am pleased to announce Amreeta Sanghera B.D.S. has agreed to carry on my work in the practice and she will be looking after you in the future. Amreeta is a caring and experienced family dentist who has recently completed a Masters in Restorative and Cosmetic Dentistry. I know that you will be pleased to welcome Amreeta as she joins Vernon Williams as a new partner at the Williams Dental practice and hope that you will extend to her the same courtesy and loyalty that you have given me over the years. We will all be working closely as a team to ensure a smooth transition. Stephanie, Kirsty, Kylie, Dawn, Steph, Cath, Lorraine, Megan, Linda and Amanda will continue to look after you, make your appointments and generally keep everything organised as they always have done. I am confident that you will continue to receive the highest quality of dentistry and I’m sorry that during your last appointments I haven’t been able to share this with you, but until everything was confirmed I had to remain quiet. Thank you again for your loyalty over the years, it’s truly been a pleasure to care for you.